I need more practice reading essays and works of criticism. And also, one of these days I intend to take a class on literature of some type so that I can learn how to think more critically about what I read. 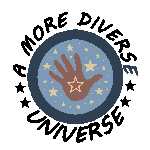 I reason all right overall, but my education has been haphazard at best and while I feel generally up to speed on many things, occasionally I encounter something that shoves me into the deep end of the pool. I end up flailing around there a bit – enthusiastically though. One of these days I’ll get the hang of swimming, and critical thought. I’m not stressing about this since I know that honestly I just don’t have a lot of the pieces yet. (After all, I missed your standard highschool English classes, and have thus far not stepped foot into the college classes I dream of.) Therefore, I came away from my encounter with Whatever Happened to Modernism? with the beginnings of a sense of what Josipovici was getting at, and a reading list full of authors I had never heard of before – authors I am eager to check out. I have never particularly cared about Modernism. I wouldn’t have known it if it tripped me in the street. In my slap-a-dash way I have careened through the worlds of art and music and literature and have begun to get a sense of what I like, but I’m still thrillingly uncertain about why I like what I like. In a way, that’s actually what this book is about. In Whatever Happened to Modernism? Josipovici explores what he likes, and why. Sure, he is making a case for the origin and history, glory days and twilight of Modernism as it all unfolded – in his opinion. He debates over what Modernism is in all its varying forms – art, music, and literature – and discusses how it got that way and how it succeeded and failed. Even to a total noob like me he is rather persuasive and entertaining. He tells an interesting story, full of artists and musicians and writers who are fantastic and freaky. 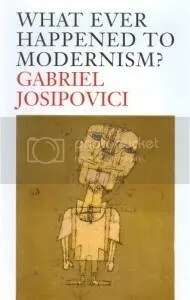 Several of my fellow Wolfish readers have responded to Josipovici’s arguments with intriguing and insightful comments of their own, and do please check them out. As for me, I kind of have to take his word for it, at least for the moment. My favorite chapter was 5, I Heard The Murmur And The Murmuring Sound, which was mostly about Wordsworth and his poetry. I went straight out and borrowed a collection of his poems from the library which I intend to dive into tomorrow. 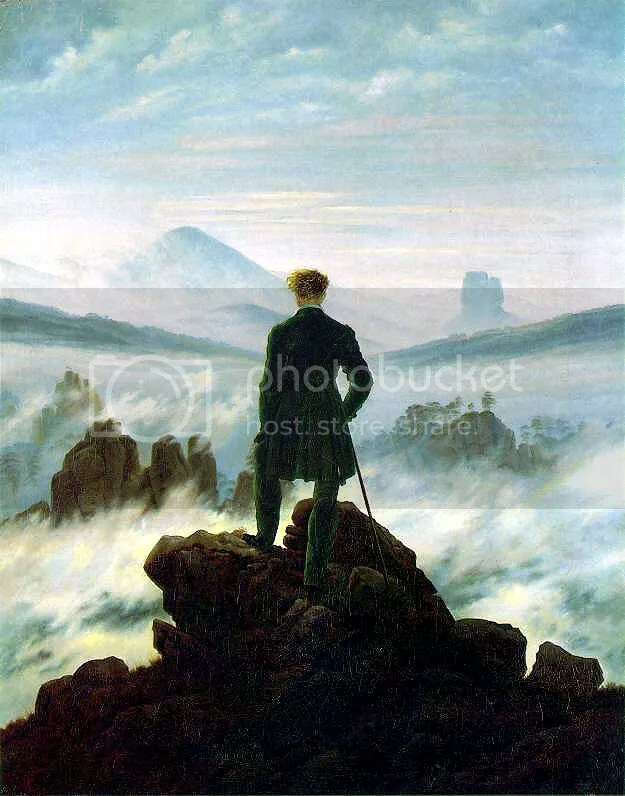 I LOVE the painting by Caspar David Friedrich, Wanderer Above the Sea of Fog, seen to the right here. It makes me want to go striding out into the wilds and be buffeted by wind and weather. I’m always going on about following threads, so you are right in assuming that this book is for me the center of a huge web of threads that I’ll be busy following for quite awhile. I have authors to look for and books to read before I get round to asking “Whatever happened to Modernism?” again, but I don’t doubt that I will return to the question. I’ll meet you back here when I do. 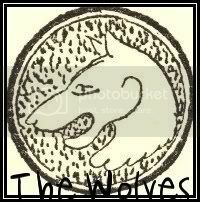 Join The Wolves next month when we read The Brief Wondrous Life of Oscar Wao by Junot Díaz. Posted in Authors, Books, Gabriel Josipovici, Non-Fiction, Non-sense, Reading, Reading Challenges, Scholarly Pursuits, The Wolves | Tags: Wanderer Above the Sea of Fog, Whatever Happened to Modernism? May I recommend a book on Friedrich? I may? Thank you. Friedrich by William Vaughan is in my favorite Phaidon series, a gorgeously produced book, packed with amazing images. The text, the life and times of Friedrich, is quite good, too, but the variety and quality of the paintings make the book. Oh my goodness, what a lovely series of art books. I will have to see how many pennies are in my piggy bank – my library definitely needs a few. Thanks for the recommendation! If you’d like a similar experience to the Josipovici but on a completely different topic, Sarah, I’d strongly recommend Maurice Nadeau’s The History of Surrealism for its mash-up of art, literature, and wild anecdotes. I first read it in my mid-20s, I think, but I’ve been craving a reread of late now that I don’t own it anymore (ahem, x years later). Maybe I should reread it in tandem with Amateur Reader’s Anything Ubu Readalong Opportunity, in fact. Agree with you that Josipovici was mostly entertaining and persuasive, and I too would like to work some more lit crit into my reading/blogging diet (i.e. I buy it and occasionally read it but hardly ever blog about it). Thanks for the tip Richard. I’ll put that book on my list. There is something sooo fun about reading about others reading – obviously we agree on that since we are both book bloggers and readers! I definitely want to expand my knowledge of where books fit into history and styles, increasingly so recently, as my reading ventures further afield. Guidebooks, etc. for my adventures.